Picking out a Christmas tree & then hauling it home is one of those things we do every year as a family. Since we got our Yuba Mundo cargo bike last summer, we've delighted in loading it up with all kinds of stuff. So I assumed we'd be heading to our local tree lot on the bike & strapping a cut tree to it. Then I heard about Treekeepers & their Christmas Tree program: $15-30 for a live potted evergreen? Sign me up! I decided on a two metre tall Norway Spruce & ordered it on their website. Then I started thinking about how I'd get it home from Trout Lake or Kitsilano, where you pick them up. Hmm. A two metre tall tree in a pot of soil would be heavy & strapping it onto one side of the Yuba rack would make for a very wobbly ride. & the kids wouldn't fit on the bike along with a two metre tree. Maybe we could try using the child trailer to carry the tree? Then I heard that Modo was looking for a family to participate in #LetsModo & bring everyone along for the ride in a Modo vehicle. Problem solved! 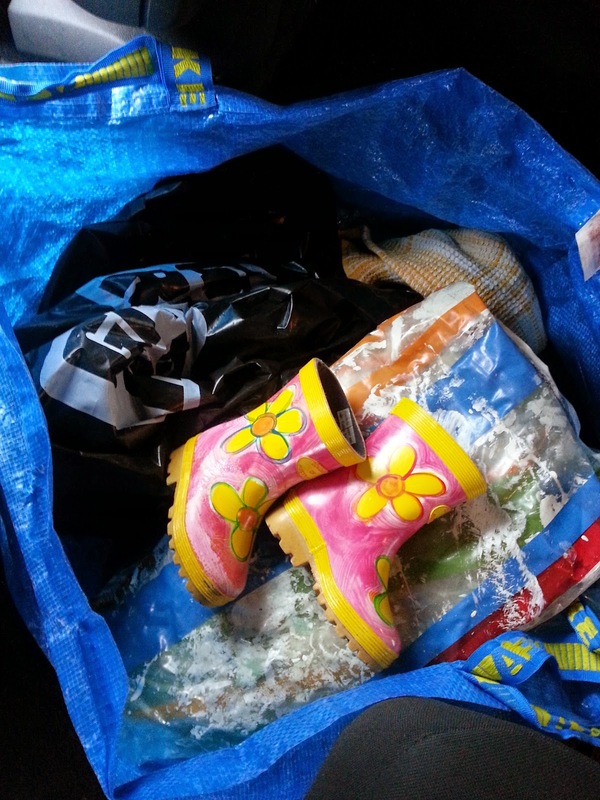 Tree pickup "kit": toddler boots optional. 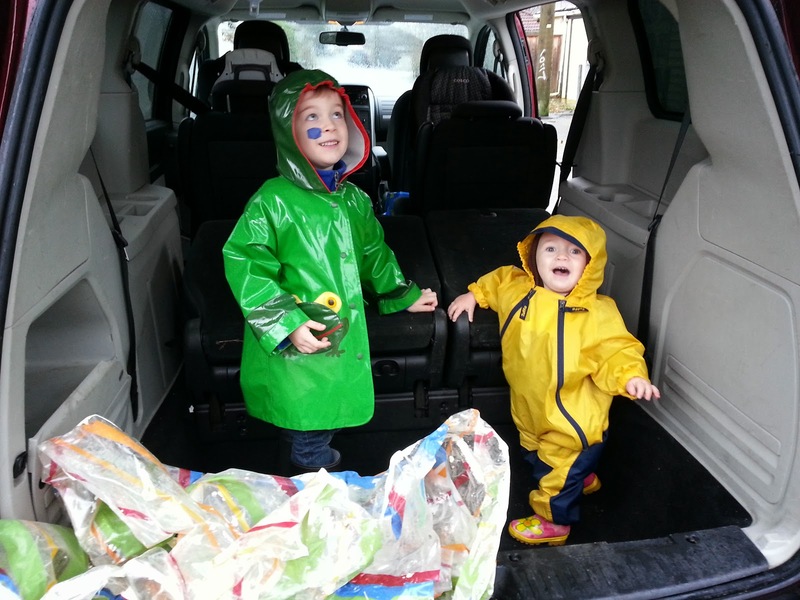 Our tree pickup day arrived, filled with "liquid sunshine", but that didn't dampen the kids' enthusiasm. Riding on our big cargo bike? Ho hum, we do that nearly every day. But driving somewhere in a big red Modo van? Woohoo! We expected the tree to lose a few needles in transport like the cut trees we've bought in the past usually do. We were pleased to discover that our potted spruce didn't seem to drop any at all. 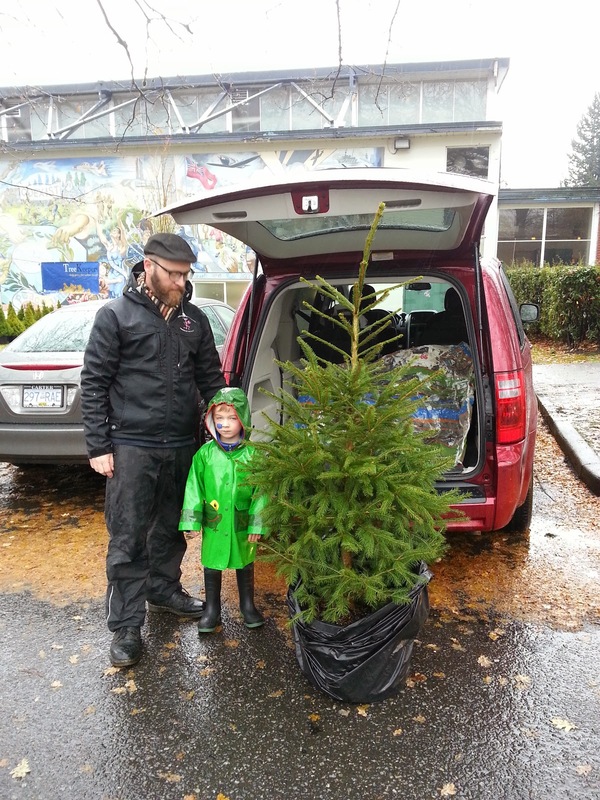 We picked a smallish tree that was a bit shorter than two metres, so it fit into the van easily at an angle. With a Modo truck that has no canopy, it would be even easier to just pop the tree upright into the back & strap it down. 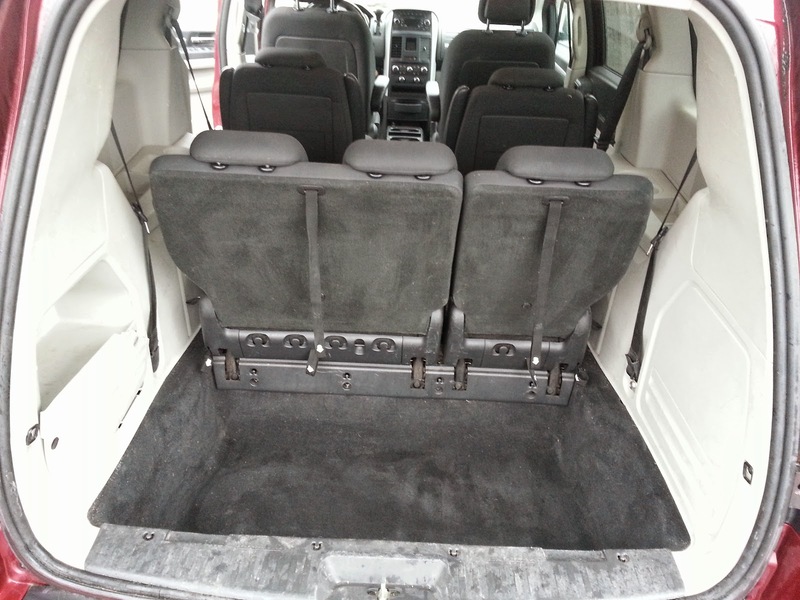 When our two little kids are old enough to not need car seats, we'll probably use a truck. Bag on, drop cloth down--ready to load in our tree. After a quick once over with a hand vacuum: all clean! If you'd like to know more about car sharing in Vancouver, please visit the Modo website: there's tonnes of information there! You can also follow other car sharing adventures by checking out the #LetsModo hashtag on Twitter & Instagram, & following Modo on Twitter & Facebook. 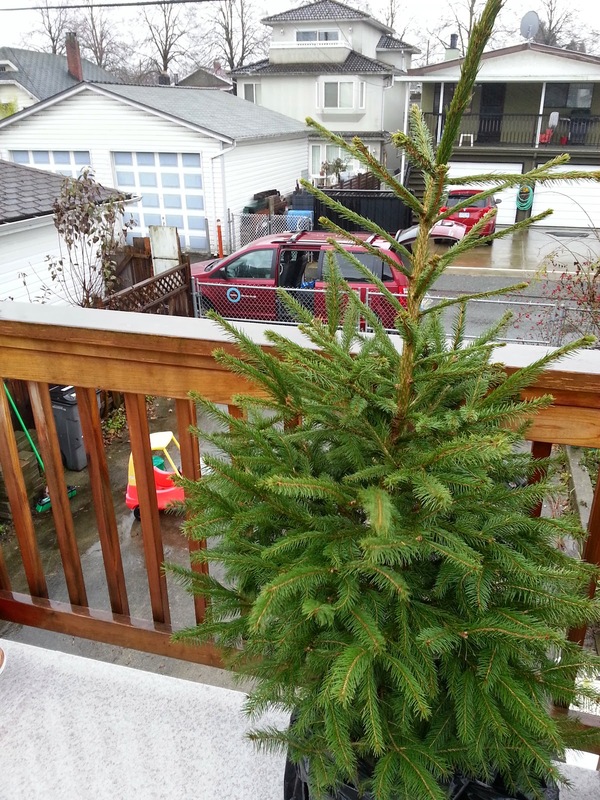 If you're interested in a live Treekeepers evergreen for Christmas this year, you'll need to order by December 12 so that you can pick it up at Trout Lake on the 14th. More details about the trees available & how you could help replant a park with your Christmas tree here on the Treekeepers website. Disclaimer: Modo covered the cost of our vehicle booking to pick up the tree, but we were not otherwise compensated for this post.